Advances in sensor and platform technology enable the collection of massive amounts of diverse types of data, making subsequent analyses increasingly difficult. The Spatial Temporal Oceanographic Query System (STOQS) addresses this issue. This open-source software program provides new capabilities for scientists to gain insight from oceanographic data. STOQS uses a geospatial database and a web-based user interface to allow scientists to explore large data collections. The user can see a quick overview of measurements in both space and time, as well focus on a specific parameter or instrument. A user may zoom into a feature of interest, then filter which data to include in the analysis. Different types of visualizations include graphs as well as two- and three-dimensional images and animations. 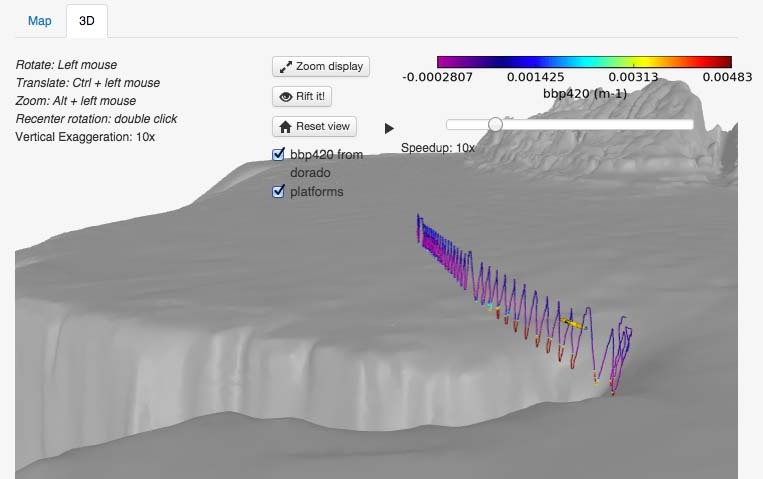 STOQS visualization of an autonomous underwater vehicle mission.